To perform your best on an adventure bowhunt, you need to eat right. Here’s how to get the needed DIY camp calories. It’s easy enough to treat a tent-camping bowhunt as a mini vacation. 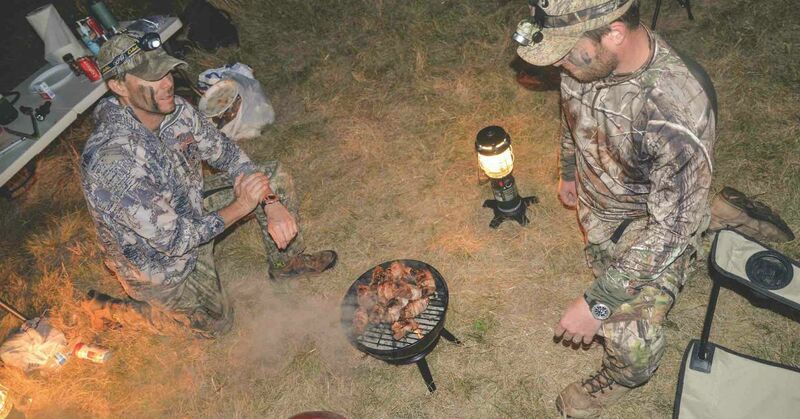 Yes, time spent away from home with your hunting buddies should be fun, but don’t let that mentality lead you into a place of inadequate nutrition due to poor camp cooking. It’s very easy to pile on the junk food in a vacation manner on certain hunts, but remember that a DIY hunt is hard work — not a beach vacation at some resort in Mexico. To keep going day after day, whether your quarry is elk, mule deer or whitetails, you’ve got to stoke the internal engine with the right stuff. Now, it’s nearly impossible to eat well during every meal, so don’t be afraid to let a cinnamon roll slip in for breakfast or let the old-reliable sandwich make its way into your pack for lunch. That’s going to happen, and it’s just fine. Just make sure to have one good, nutritious meal at the end of the day to balance things out. This is easier said than done and does require some planning. My strategy is to take a pound of frozen venison, preferably venison that is cut into stir-fry strips or cubes, and put it in a 1-gallon zip-seal plastic bag. After that, I slice up peppers, onions, asparagus and any other vegetables I feel necessary and add them. It’s okay to use mushrooms as well, but they can get kind of slimy and gross after a few days in the cooler, so plan to eat those fungi-filled meals first. No matter what your meat and veggie combination looks like, you’ll want to make sure you can dump it right into a pan once you get back to camp, and that means you’ll either need to add butter or olive oil directly into the bag. After that, it’s a matter of adding some seasoning and sealing the bag back up. For every day that my buddies and I plan to hunt, I’ll create one of these meals ahead of time. They go into a good cooler, and at the end of the day’s hunt, I’ll simply fire up my stove and dump the whole bag into a pan. It usually takes about 10 minutes to get close to fully cooked, and then I’ll add a bag of instant rice and let the whole thing simmer for a few minutes. The last step is to dish out the hot sauce and tortillas and dig in. This is camp cooking at its finest. The key step is to prep this all in the days leading up to your hunt. If you think you’re going to want to create these meals after a hard day of hiking the hills, you won’t and that will lead to poor choice nutrition-wise. Plan ahead regarding camp cooking and reap the rewards of the right nutrition on your next DIY adventure. In addition to a hard-side cooler, every camp should have a topnotch soft-side like the ultra-portable YETI Hopper Backflip 24 ($300), which features a 100 percent leak-proof zipper and a tough, DryHide Shell. YETI products aren’t cheap, but they offer the best quality and longevity out there, which certainly justifies the purchase. Of course, you’ll need something on which to cook your meals, and for that task it’s tough to beat the new FireDisc 36-Inch Tall Portable Cooker ($400). This propane cooking system is designed to season like a cast-iron skillet, is a breeze to clean, and breaks down into a surprisingly portable package. Lastly, the new ChowPal ($27.50; photo below) from Outdoor Edge is an excellent option for camps ranging from cushy to Spartan backcountry affairs. The set weighs only 2.4 ounces, and in addition to a fork, knife and spoon, it also contains a graduated wrench, a can opener, a bottle opener and a screwdriver. Keep one in your camp tote and one in your truck, and you’ll be covered every time the dinner bell rings, no matter where your travels take you.